Mid-Life Cruising!!! : Beach Town Living! As I mentioned in an earlier post, we took possession of a condo one block from the beach just before vacating our boring condo near our boat in Louisiana. It's weird how fate stepped in at just the right time and threw this opportunity right in our laps! It sure is making the transition to living aboard and getting Nirvana ready for cruising a lot easier. 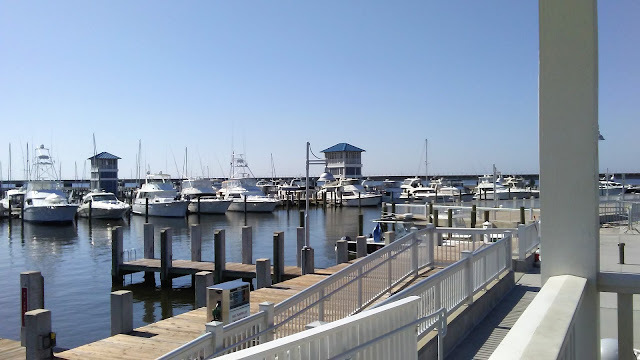 The photo below is the entrance to our condo's complex, and the photo above is the marina just one block away. So where is this condo located? It's in a little beach town in Mississippi called Bay St. Louis. It's a cool lil town that Ken & I have often visited, as it's only about 35 minutes from Slidell, where Nirvana is located & where we have lived since childhood. It's also just minutes away from Biloxi, Gulfport & Pass Christian, where we once marched in a parade for the Honorary Mayor of Key West, Mayor Gonzo! Below is a photo of the bay and the Bay Bridge, with a peek of the beach just left of the pier. 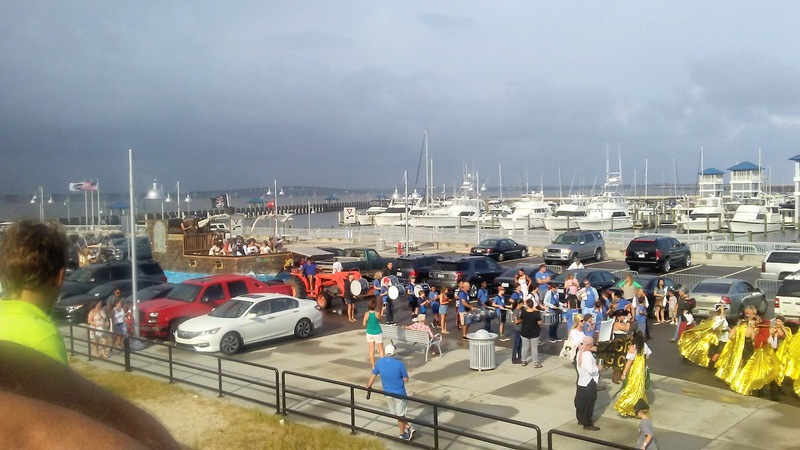 Just outside of this photo to the right is the marina .. then about 8 more miles of beach! Below is a photo from one of the afternoons that we made a quick trip to drop off some items at the condo. This is a popular bar named Bouy's that has live music every weekend. 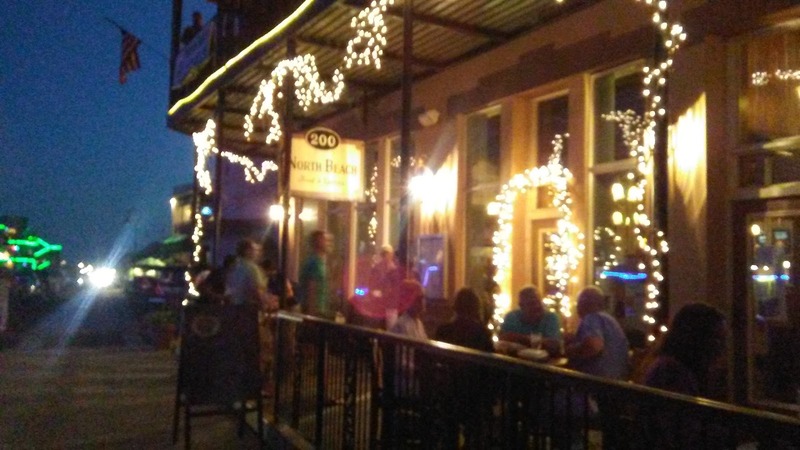 The "hot spot" on Main Street is between this bar & the marina. 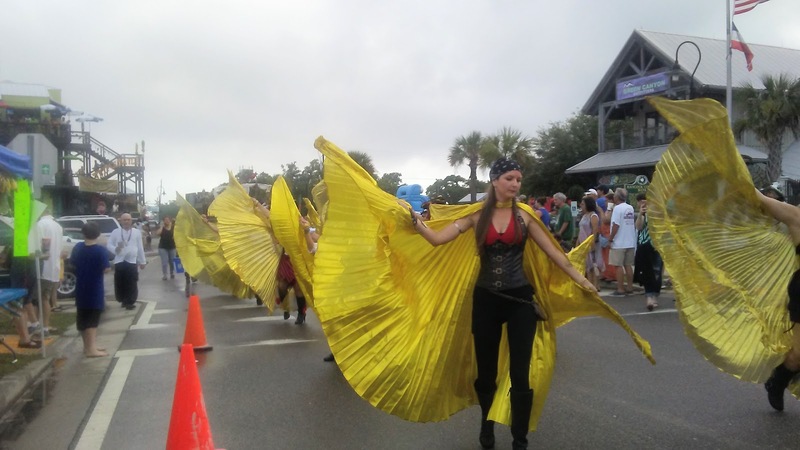 Like New Orleans, you can walk around the streets with alcohol in hand! There's also tons of golf carts .. bar hopping & roaming the streets. As you can see, just past this bar is a stretch of beach. 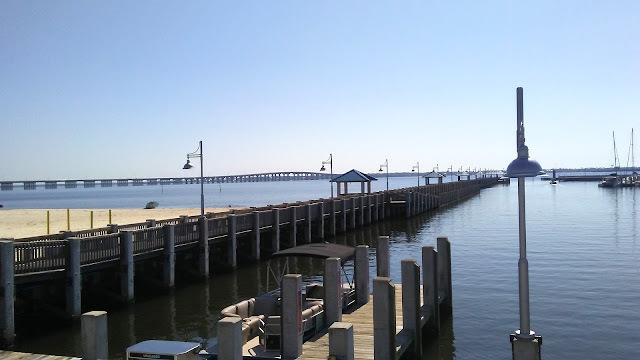 There's a 4.5 mile concrete bike path, and the beach continues on another couple of miles to the Silver Slipper Casino .. a place we like to go every now & then for $5 blackjack and cheap, good buffets! 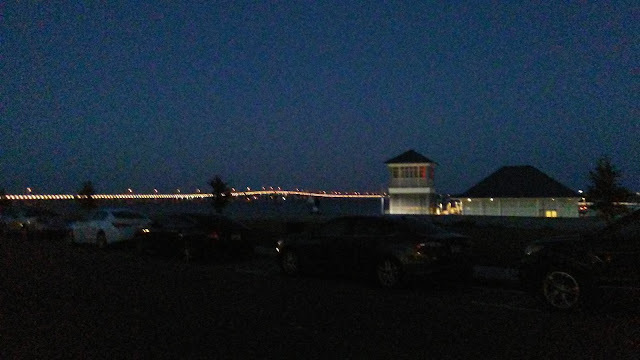 Here's a few quick pics (poor quality) I took at night .. I can't wait to walk the beach or bicycle the neighborhood & take some photos of this area! As I mentioned in an earlier post, our first stay was for Mother's Day then we were back to Nirvana for the week. This past weekend we headed back to the condo in hopes of avoiding the storms in Slidell. 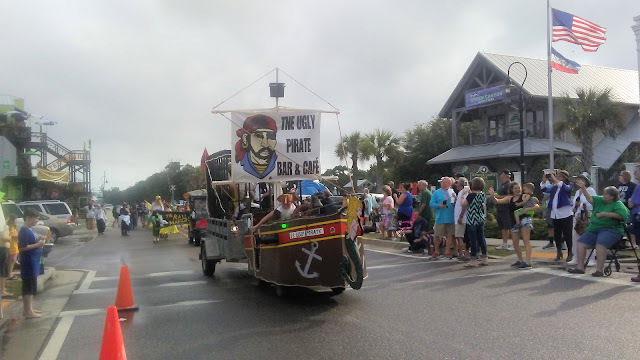 While the storms followed us, there was a break in the weather just in time for the annual "Pirate Day in the Bay" parade! The parade starts at the marina, and we watched the pirates line up. 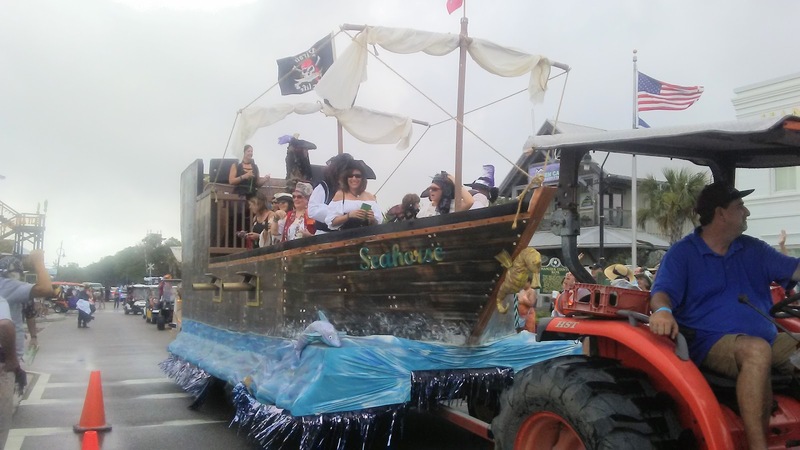 The pirates took to the streets! 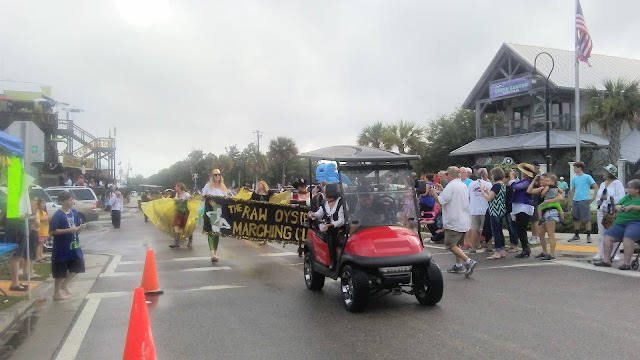 There was a band, the "Raw Oysters" marching club, and several golf cart "floats", which threw beads, pirate trinkets & oyster shells. We caught some beads .. wish I could have gotten one of the shells! 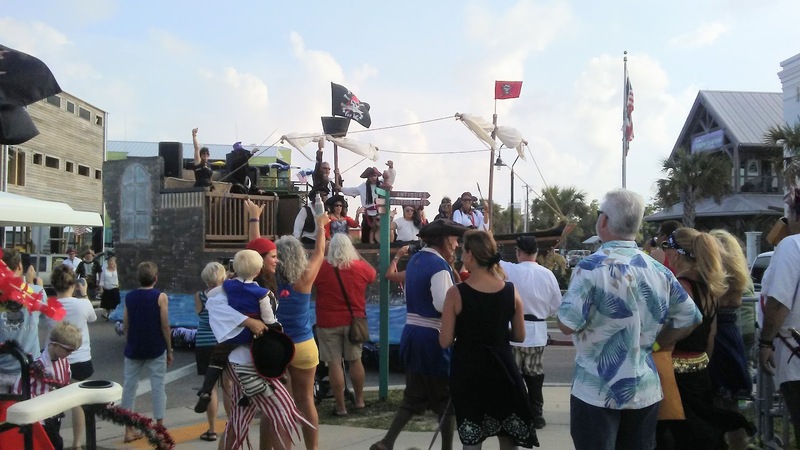 The parade ended at "The Ugly Pirate" .. a tiny bar just steps away from our condo. This bar is where the locals hang out, and they have great pizza. In fact, this is where fate stepped in and the beach condo came into our lives! So many things fell into place that night in late March. 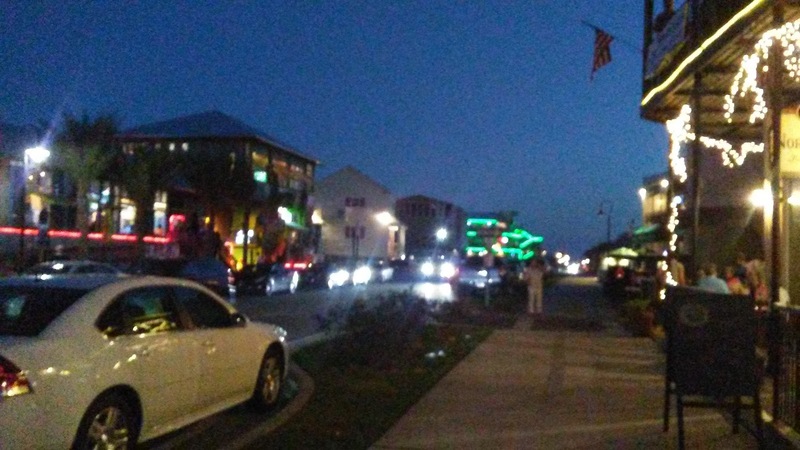 Ken & I had taken a ride to Bay St. Louis for a change of scenery, and we'd stayed a while on Main Street enjoying music & beer. We were getting hungry and decided to try out the pizza at "The Ugly Pirate". We'd never been there before and had been wanting to try it out. It was just off the main drag and probably a bit more laid back. As we walked to the bar, we passed a set of condos and noticed how pretty the setting was. We briefly thought how cool it would be to live at a place like that .. so close to the beach & the bars. We sat at "The Ugly Pirate" a while, enjoying pizza & live music. We watched all the golf carts come & go, and really began to realize how cool this town was. We had paid the bill and were just about to leave when I noticed a familiar truck pass by. It was our daughter's in-laws .. what were they doing here?! We decided to wait until they arrived and say "hello". 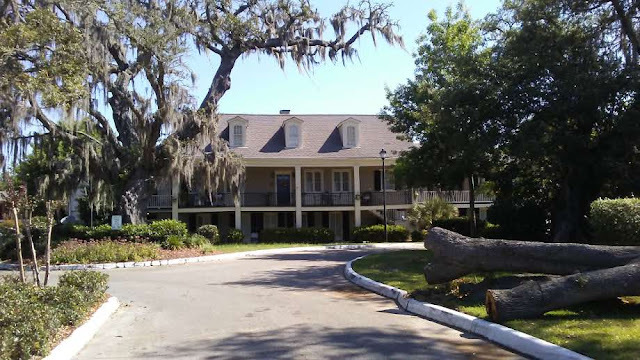 As we talked, they mentioned that they were in the area because they were meeting "friends of a friend" to look at a condo ... at the same complex we had admired earlier that day! They were thinking of renting one for 6 months & looking for another couple to split the 2-bedroom with them. Just about the time they casually asked if we'd wanna go in with them, their friends showed up and they left to look at the condo. We didn't know if they were really serious, and we didn't know if they were coming back anytime soon so we headed home. The entire way home I kept thinking about that condo. Were they really serious? Should I call them in the morning? Wouldn't it be cool to have a condo in a beach town to make the transition easier? After all, we were about to give our 30-day notice to our landlord and Nirvana really wasn't as far along as we'd hoped. The next morning I texted our daughter's mother-in-law .. I didn't wanna put her on the spot. I asked her how she liked the condo, and she replied that it "was pretty nice". Hmmm .. what next? I then texted her & said to let us know if they were serious and wanted another couple to share the condo with. She asked if I was serious, and I wasted no time saying "YES!". We talked on the phone, and she said that she'd been talking to another couple but they hadn't committed. Sight unseen, I said we were in. By mid-April, we were signing a 6 month lease! We borrowed a bed from my dad, our kids contributed a futon, kitchen table & entertainment center, we brought our two tvs & a bunch of kitchen stuff that won't fit on Nirvana, and our "roommates" have provided a bunch of cool stuff for the condo & the beach. We love it! Oh, and did I mention this place is cheap?! It's just over $350 month for our half .. and it's really nice. We're saving about $600 bucks a month by switching condos! Plus, our condo is right outside the pretty in-ground pool and grill area. We've already met a few of the neighbors .. all extremely nice, all about our age, and a few of them also sharing with another couple. It seems that every weekend everyone gets together and hangs out ... pinch me! Now, what are the odds of this happening?! We'd never been to this bar, we were just about to leave, we just happened to run into our extended family, and we just happened to rent a condo in the same place we had been admiring! If we hadn't seen them that night, none of this would have happened .. and talk about perfect timing with vacating our other condo! Also, since their son is married to our daughter .. it's all family. The kids came down the past two weekends .. we're already making priceless memories with them! We'd like to think that this is a sign of things to come, and that this was a little "push" in the direction we want to go. If this condo hadn't been available, I have a feeling that we'd have stayed past mid-May in our boring condo. We probably would have stay another 4-6 weeks until our jobs were complete & Nirvana's electrical and lights were done. The beach condo helped us keep our goal of getting on the boat by mid-May, and we now have an awesome place to enjoy the beginnings of our "unemployment"! I tell ya, we hated our boring condo in Slidell. I mean .. hated! While we love the city that we've grown up in, there's just not much to do. 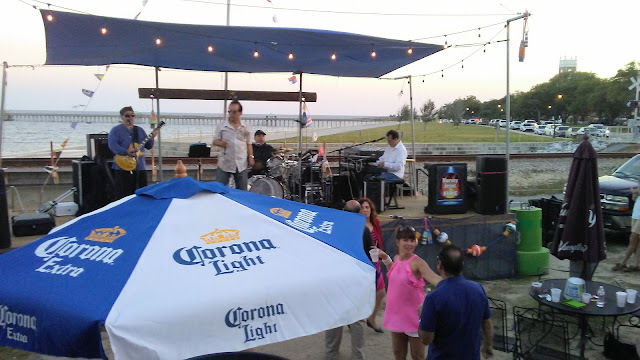 Now we have all sorts of things to do .. bicycling, walking on the beach, hanging out & enjoying live music, roaming the streets & people watching .. all sorts of stuff! We've already enjoyed sitting on the beach Mother's Day evening with our "roommates". We packed a small cooler with beer and we were set .. drinks in hand & toes in the sand! Behind us was live music from the bars .. life is quickly changing for the better. We're already getting a taste of freedom. It's kinda surreal, and part of us fears it'll be snatched away somehow. Places further South are in our thoughts, and we're just hoping Nirvana does indeed take us there. We never know what's around the corner, and we'll only find it if we look! 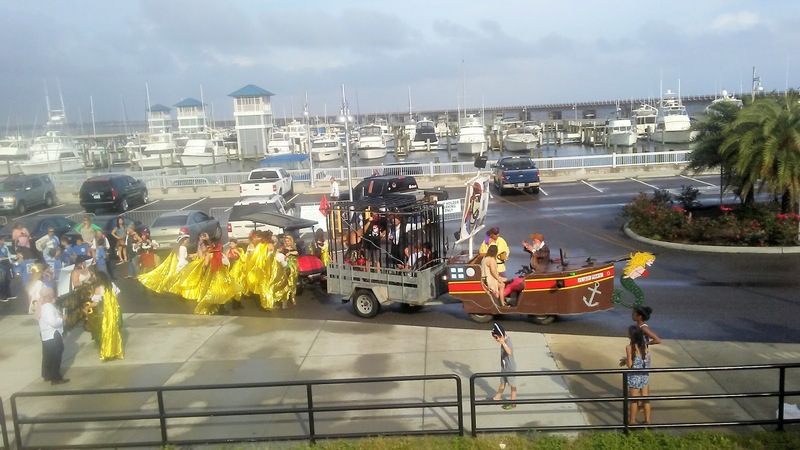 I love parades - that looks like a really fun one! It's great how everything worked out with the condo. It certainly was meant to be. Great story! Can't wait to see you start your big adventure.